Since 2011 Harvest Moon has been fully committed to sustainable, farm to table cuisine. We grow our own produce, raise our own pigs and chickens and source our ingredients from farmers we know as friends. Our team is made up of farmers, outdoorsmen, artists & activists who love Maine and her harvests. 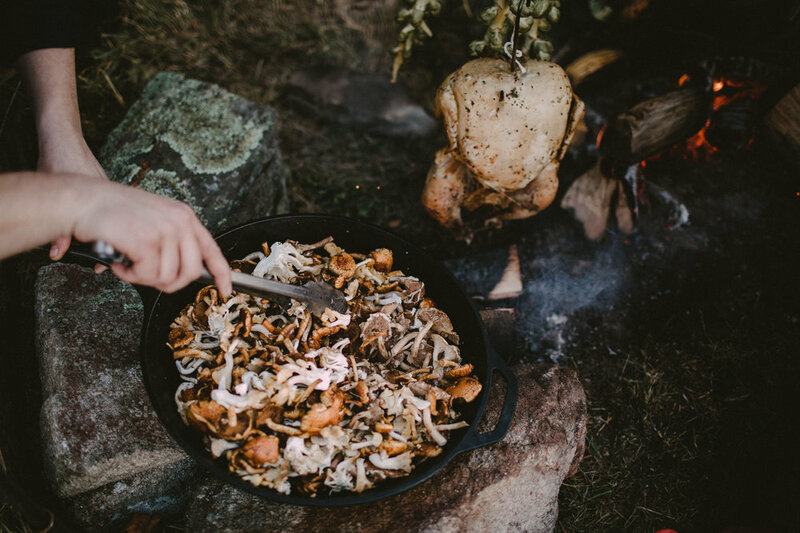 From Aroostook wheat to Pemaquid oysters, foraged mushrooms to the best local meats, our ingredients are at the center of what we do. We are a full-service catering company able to provide all of the food and beverage elements that will make your special occasion unforgettable! We believe in the importance of cooking food over a real fire, so much so that we designed our business around it. To watch your meal be prepared right in front of you creates a connection to the food like no other - it is both primal and progressive in an industry that strives to make the cooking experience as simple as possible. We strive to make it the most fulfilling eating experience - from the source of the food to the way it’s honestly presented. Harvest Moon is proud to offer fully licensed and insured bar service! We know that a good meal is always made better by the right beverage and are very excited to offer full bar service. We love making specialty cocktails using fresh local ingredients, selecting the perfect local beer or finding just the right wine to compliment the food you select for your party. We want to work with you to create the perfect bar menu! Honestly, we love parties. From the early planning phases to the final clean up it's such a fun adventure that we love to be a part of. No two events are ever alike and we thrive on the thrill of building the perfect event. We are mostly known for our wood fired weddings but offer much more. From causal pizza and bbq buffets to upscale family style and plated affairs, our style of cooking and service can accommodate a wide range of events. We work closely with our clients to make every detail perfect. You can count on our attention to detail, our commitment to local sourcing and our reputation for delicious fare. We don't book many events each year by design so let us know soon if you are interested in a Harvest Moon event. Filling out one of these forms is the first step to booking Harvest Moon for your event. You will receive our newest menu with pricing and be contacted shortly by Arie our Events Director. We are currently testing new software for our inquiries in our effort to be a paperless company. It’s a big change for our small company but hope it leads to faster interaction with our clients and way less printed documents in our office! Thanks for your patience as we work out the kinks in this new system!